They say sometimes in life that truth is stranger than fiction and in the case of The Claudettes that is absolutely true. There�s no way that anyone in their right mind could develop a story any more bizarre than theirs. You just can�t make this sh** up. So, kudos to Mike Powers of Yellow Dog Records for bringing this band to light, and then next time I see you Mike, I need to hear the story of how you came across the Claudettes! So, picture this: a Korean bar owner named Claudette, an amazing drummer who has played with the likes of Koko Taylor, Marvin Hamlisch and others in the form of Michael Caskey; the keyboard genius of Johnny Iguana who has backed Junior Wells, Buddy Guy, Otis Rush and a who�s who of Chicago blues legends and Tatyana Prozorov, a Russian immigrant and tenant of Claudette�s who owes her landlord money. Stir the gumbo and you have a fearless promoter in the form of Claudette who has managed to stir up an amazing buzz around the talents of Johnny and Michael while using them to promote her bar talents with the help of Tatyana. I�m amazed that Johnny and Michael manage to function at all in this madness but they do, and the result is their new disc, Infernal Piano Plot�Hatched, on Yellow Dog that managed to captivate my attention without a word spoken or a lyric sung. This is definitely one of the freshest discs that has crossed my listening ears in a long, long time and one I would strongly suggest that everyone pick up as soon as they can! The entire disc is an instrumental menagerie of tempo, pace and mood that left me deeply impressed with the talents of Messrs. Iguana and Caskey. I hope I do it justice. The first cut, �Stumblin� Home Satisfied,� is an upbeat sort of jaunt through the neighborhood for me. Johnny�s keyboard talents are very evident and Michael�s drum work is the perfect complement to Johnny. �Big Sucker Punch� is a tad more intense. It�s like 'Damn! I got caught! What do I do now?' And on Johnny goes. Up next is �Deep Soul for High Society� and it�s an attempt at sophistication to appeal to the upper class. Passionate, adventurous, it�s another great tune! Our next adventure is down south to �New Orleans Yard Sale (New 11-Bar Blues).� Not quite Bourbon Street, our fearless duo is somewhere in the Garden District, having a great time. The title cut, �Infernal Piano Plot�Hatched!� is next and it�s an upbeat, crazy tune that is very melodramatic and intense. I can see Johnny in my mind�s eye hammering the keys while Michael is kicking the crap out of his bass drum. Definitely the Claudettes at their best! �Serenading the Clean-Up Crew� is next and it�s a much slower tempo tune, thanking the cleaning crew for cleaning up the house that Johnny and Michael just tore down! �Tremblin� Blues� is another up-tempo tune that feels like Johnny and Michael have woken up from a long night of raising hell and have stuck their heads out into the sunlight to see what the day will bring. Our next cut, �Motorhome,� feels like the boys are late for their gig and fracturing a speed limit or two to get there on time. Claudette fines the boys $50 each if they�re late for a gig so I imagine they will get there on time if they can. �Land of Precisely Three Dances� follows and it�s another upbeat, frenetic tune that defies description. We close with the defiant �Chin-up Tango,� with a definite Argentinean flair and �Do You See It Too?,� a tune that oddly feels like a celebration. We�ve made it through to the light; can see what�s ahead and it�s all good. While Claudette ultimately lost her bar, she kept Johnny and Michael on salary to help her peddle her drink wares throughout Chicagoland. While I have a hard time imagining LED promotional signs on the boy�s lapels and Tatyana taking the stage every now and then to plug a drink special, it�s all true. I�m definitely not making this sh** up! Frivolity aside, The Claudettes are an amazing new find and classic addition to the Yellow Dog Records stable of artists. 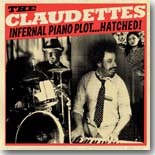 Grab a copy of Infernal Piano Plot�Hatched from The Claudettes at their website, www.theclaudettes.com, and hit play. It�s almost the most fun you can have with your clothes on, trust me! The Claudettes are Johnny Iguana (piano) and Michael Caskey (drums). That�s it --- two guys, piano and drums. No bells and whistles or special effects --- just two guys playing piano and drums as if their lives depended on it. The duo got their start as the house band for a lady named Claudette, who owned a bar in Oglesby, Illinois. When Claudette lost her lease, she took them on the road and began booking gigs for them all over the Midwest in other bars, or in places like Blockbuster Video or the Staples center (not the arena in L.A., the actual center of a Staples office supply store). The Claudettes wowed all of the ir audiences with their incredible instrumentals, usually consisting of frantic arrangements mixing the blues with jazz and soul. As this went on, Claudette had no idea that Iguana was a longtime vet of Junior Wells� band, played with Otis Rush, and has recorded with Carey Bell, Lil� Ed Williams, and is a part of the esteemed band that made up the Chicago Blues: A Living History recordings, or that Caskey has played with Koko Taylor, Chuck Mangione, Marvin Hamlisch, and has toured with the Heritage Blues Orchestra. Now The Claudettes have released an album, on Yellow Dog Records, called Infernal Piano Plot�HATCHED! I would give you highlights, but I would just be listing all 13 tracks. These guys play the blues, with tracks like the opener, �Stumblin� Home Satisfied� or the Little Brother Montgomery classic, �Tremblin� Blues,� but they also play tunes like the title track, a hyperspeed spy-flavored blues that threatens to catch on fire, �Deep Soul For High Society,� a greasy soul rocker that would put a smile on Ray Charles� face, and a manic, breathtaking pair of tunes (�Motorhome� and �Land of Precisely Three Dances�) that bounce around crazily. Though Iguana and Caskey play their instruments like men possessed, everything falls together perfectly. Their sense of rhythm and timing is impeccable and as impressive as it sounds on disc, I�m sure their live performances leave eyes wide and jaws agape. I urge you to give The Claudettes a listen. I promise that a) you�ve never heard anything quite like Infernal Piano Plot�HATCHED!, and b) you will want to hear more of it when you�re done.